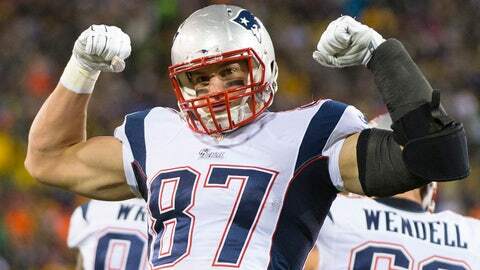 Rob Gronkowski set an NFL record on Sunday night, further solidifying his place in history. Rob Gronkowski is a touchdown-scoring machine for the New England Patriots, which is why the “Gronk Spike” is so incredibly popular. On Sunday night against the Indianapolis Colts, Gronkowski put into perspective just how great he's been throughout his career. With the Patriots trailing by one and 11:03 left in the third quarter, Tom Brady found Gronkowski wide open over the middle. Gronk made one man miss and found the end zone for the fifth time this season. More importantly, it was the 60th touchdown of Gronkowski's career, as he reached the mark in just 70 career games — an NFL record for a tight end. He joined Tony Gonzalez, Antonio Gates, Shannon Sharpe, and Jerry Smith as the only tight ends to catch at least 60 career touchdowns. The previous record was held by Gates, who accomplished the feat in 110 games. Gronkowski did it in 40 fewer games — or two-and-a-half seasons quicker. With the path that he's on, Gronkowski is set to become one of the greatest tight ends in NFL history, if not the best.